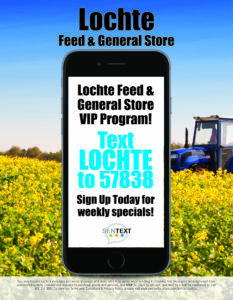 Signup for our VIP TEXT program at Lochte Feed. Just text the word LOCHTE to 57838 to signup. That’s it! We will send you special promotions, on the spot offers, and announcements. Never miss what’s happening at Lochte Feed! This entry was posted on Sunday, November 25th, 2018 at 9:39 pm	and is filed under News & Updates. You can follow any responses to this entry through the RSS 2.0 feed. Both comments and pings are currently closed.